Boutique family owned developer Your Style Homes is reaping the rewards focussing on size with their latest project at Cannon Hill in Brisbane’s east nearing sellout despite a challenging Brisbane apartment market. Your Style Homes has one-bedroom units featuring a combined internal and external floor space of 69 sqm including balcony or courtyard, significantly larger than Brisbane’s reported typical one bedroom apartment size of 52 sqm. Just two dwellings remain for sale in the 30-apartment complex after the project launched to market in late 2015 with prices starting from $325,000. The high quality development is now attracting strong interest from younger renters who have begun to move in. 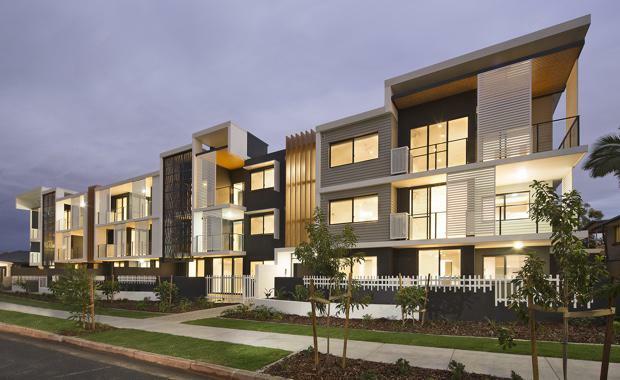 Your Style Homes managing director Dean Parker said the apartments addressed all buyers’ wish lists in a suburb with a low suburb vacancy rate of just 1.22 per cent. “Our spacious, well-designed one bedroom apartments started at $325,000 - well below the $400,000 to $499,000 price point, considered the “sweet spot” for a one bedroom Brisbane apartment. “These apartments offered two different colour schemes and a choice of a balcony or courtyard with secure car parking, providing a spacious and high quality offering residents. “Contemporary designs including stone benchtops in kitchens and bathrooms with high quality inclusions including built-in Bluetooth audio systems, stainless steel appliances, porcelain basins, built-in robes, glass balustrades on balconies and fresh colour palettes all feature in Allure’s dwellings. “We know buyers seeking one and two-bedroom stock are price-sensitive but also wish to purchase a dwelling that maximises value for money through a lower price coupled with strong potential yields. This value was recognised by buyers at Allure, and has now been passed on to renters who are now eager to move into the development,” Mr Parker said. Your Style Homes' Elise and Dean Parker (Photography by Carole Margand Caco Photography)The project sits less than 10 kilometres to Brisbane’s CBD and is placed 150 metres from the forthcoming $600m East Village precinct which is set to offer high quality retail and restaurant options from the designers of Brisbane’s Emporium. Allure apartments are only a 550m walk to Cannon Hill’s Kmart Plaza. “We’ve received a great deal of rental interest; both buyers and renters told us they don’t need to be right in the centre of the CBD – they just want a bigger apartment offering within the CBD’s 10 kilometre radius that presents better value within a less-dense region. “Presenting purchasers with a larger-than-average square meterage, along with ample natural light, and the option of selecting between several different open, well considered floor plans at a lower price point has resulted in a highly attractive development, delivering a near-sell out in market many other developers have found to be challenging,” he continued. “Allure on Ludwick is a testament to the appeal of larger, more affordable apartments on the edge of the inner city which have entertainment and dining hubs ‘mushrooming’ around them, presenting an appealing option for both buyers and renters,” Mr Parker concluded. The two apartments remaining for sale include one one-bedroom apartment for $345,000 and one two-bedroom apartment for $465,000. Two bedroom apartments feature a combined internal and external area of 93 square metres.